The Hudson’s Bay Eagles are now used to winning. Back-to-back winnings seasons will do that. So it was kind of a shock to the system for the Eagles to open this season at 0-3. In week 4, the Eagles got the breakthrough they needed to earn a victory. At the same time, the Eagles also understand that one win is not the end goal. Plus, they have the Mountain View Thunder coming to Kiggins Bowl this week. Still, a team has to get a first win before it can think of more wins. The Eagles had another slow start, something the team is trying to fix. Still, there was no panic, the coach said. The Eagles remained disciplined and executed the game plan. Bay held Franklin to 44 yards of offense. Derek Barnes had a fine performance, causing mayhem for the Franklin offense, Lions said. Barnes had multiple tackles-for-loss. On offense, Treyce Teague showed off more skills. A new week, a new challenge for the Mountain View Thunder. And games with even more meaning. “You go into league play, it’s another transition,” Mountain View coach Adam Mathieson said. There are several transitions for a football team. Weight lifting in the winter, spring ball, summer camp, then non-league football game. Starting now, league play. Outsiders might wonder what the Thunder have to clean up, especially after winning the last three weeks by a combined score of 157-21. In the win over Heritage, the team amassed 610 yards of offense. The coach sees 14 penalties for 150 yards and three turnovers. “That sounds awful,” Mathieson said. And those things must be corrected if Mountain View is to go on a long November run. Next up for the Thunder is Hudson’s Bay. Mathieson had a reminder for his team and Mountain View’s fans, too. “They’re zero and zero this week, and so are we,” he said. As far as last week’s game, those 600-plus yards, those points, and Jack Mertens earning a 100-yard rushing game, all impressive. Mathieson also pointed out the defense of Michael Bolds. “He had two picks and three pass break-ups. Really did a good job,” the coach said. And, of course, quarterback Garrett Moen is still having an incredible season. Mathieson was told Moen is third in the state in passing among 3A quarterbacks. Against Heritage, he threw for 273 and ran for 79 yards. Now, the Thunder are looking to keep putting up the big numbers, but in games with more meaning. It’s time for Mountain View to start defending its league title. The Evergreen Plainsmen overcame an injury to a key player when another key player stepped up into an old, new role last week in the win over Rochester. Rayn Preston, a senior who played quarterback as a freshman and sophomore, returned to the signal caller spot after an injury to starter Ryan Blaize. Preston then completed 11 of 13 passes for roughly 160 yards and two touchdowns. And for the second time this season, the Plainsmen had a bounce-back game. Evergreen lost a heartbreaker in Week 1, then won in Week 2. 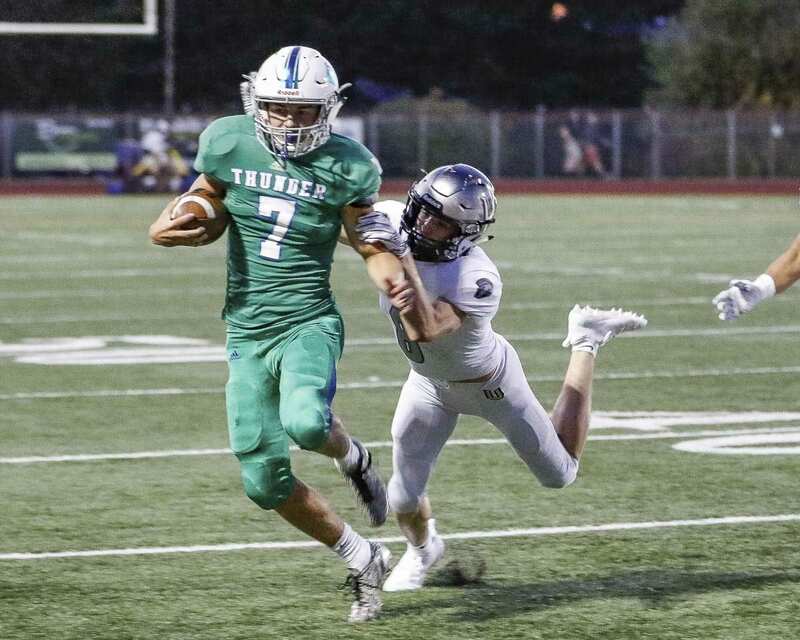 Evergreen traveled a long way to lose in Week 3, but had one of the best performances in Week 4. “Always good when the kids come out and play like they’re capable right from the start,” Hyde said. Now it is on to league play. Evergreen will head to Kiggins Bowl on Saturday to face Fort Vancouver. While it is true that Fort has been struggling, Hyde said his players will not overlook the Trappers. As far as the rest of the league, Hyde says it is Mountain View, and then everybody else. “Mountain View might be the best team in the county. I don’t care about what happened in the Union game. I think Mountain View might be the best team in the county,” Hyde said. After the Thunder, though, Hyde said the league could play out much like it did the past two seasons when teams were tied for playoff spots and had to have a tiebreaker. Kelso, Prairie, Hudson’s Bay, and, yes, his squad, should be competitive. The game was tough, the result even tougher to handle for the Prairie Falcons. Their rivals got the best of them in Week 4. It was all Battle Ground, from start to finish. It also was an eye opener for the Falcons, who will open league play this week against a very similar team. This week, the focus at practice is being physical and disciplined. On Friday, the 3A Greater St. Helens League part of the schedule starts, and the Falcons must travel to take on Kelso, another physical team known for its rushing attack. “I am excited to get up there and see our kids compete and be that physical football team that I know we are capable of being,” Peck said. The move from non-league to league gives every team a chance at a reset. It is the little things that can go a long way. 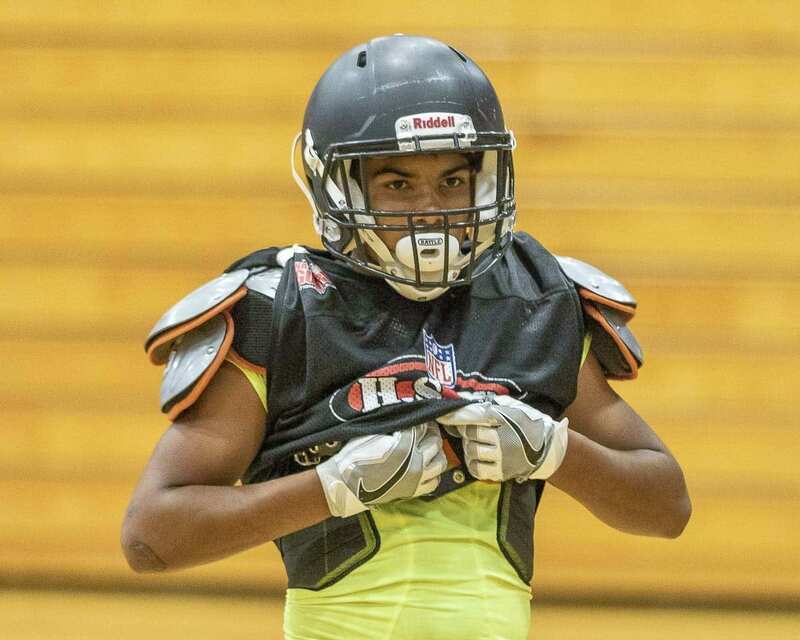 The Fort Vancouver Trappers are not yet in position to win, but they are showing improvement, and they are showing up, going to battle, every week. In Week 4, they were rewarded with some points for the first time this season. Isaac Martinez returned an interception to the house for the first Fort Vancouver touchdown of the year. Now, the Trappers begin league play. They know that no one expects them to get a win in the 3A GSHL. But they will be there every week, trying to get better. The coach noted the strong leadership of Nick Laurenza, Jonavin Salavea, Jonathen Heather, and Myron Lawrence. The Trappers have impressed their opponents. Evergreen takes on Fort this week at Kiggins Bowl. “You don’t look past that team,” Hyde said.